The MasterControl's not perfect, but it still manages to pack in a ton of features for the price. Good value for money. Tactile, easy-to-use control surface. Direct Monitoring makes cue mix set-up a breeze. Input gain and Talkback controls are badly placed. Limited range of accessible parameters. The MasterControl features enough control and audio options to satisfy the majority of producers. The audio interface is an essential piece of kit for most musicians, and if the one you favour doesn't come packed with nice-sounding mic pres, you might need one of these, too. If you happen to have one trusted 'external' synth you might also need a MIDI interface, and if you're one of the many who hates mixing with a mouse, a control surface might go on your shopping list, too. As manufacturers have become more savvy to our needs, hybrid units offering some or all of these requirements in a single box have sprung up. 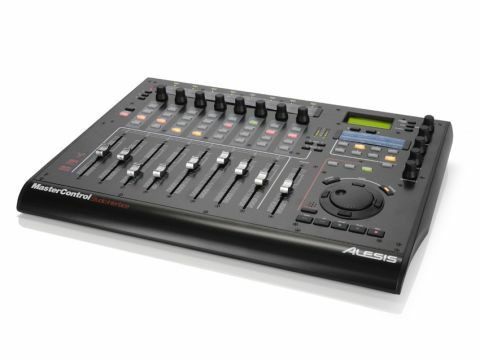 The latest of these is Alesis's MasterControl, which offers a FireWire audio interface with I/O options aplenty, a control surface with long-throw faders plus a series of monitor configuration options to keep larger studios happy. With a retail price of just under £900, the MasterControl seems to offer more than reasonable value for money, but is it too good to be true? As you can see from the pictures, the MasterControl is a medium-sized control surface 'wedge' which slopes gently downhill from back to front. The top surface concerns itself with the comprehensive control options (more on these shortly), while the back panel acts as the unit's patchbay. There are two XLR/line input combi ports with insert points for each to accommodate your channel strip processor of choice, a phantom power switch and Gain dials for each input. Beside these, a further six line inputs are offered alongside six line outputs, provisionally organised into three separate stereo monitor configurations. Two independent headphone ports come next, alongside MIDI In and Out ports and the MasterControl's digital options, which include an ADAT connector, a configurable port that can accept another set of ADAT signals or optical S/PDIF signals and, lastly, a dedicated S/PDIF port. Comprehensive though this is, all digital connections concern themselves with input alone - the unit features no digital audio outputs, which comes as a slight surprise. Two FireWire 400 ports and the 9V DC power supply complete the line-up, which in the main is nicely organised. Two frustrations prevail on the back panel, however. Despite fairly generous I/O, the provision of only two mic preamps seems a strange decision in light of fact that the MasterControl's main competitors are much more adequately endowed in this regard. Secondly, the design and positioning of the Gain dials for these inputs on the back panel represent a bad decision. While we can understand the logic in keeping these next to the inputs themselves, the dials are too small, they're hard to access and they're extremely fiddly to adjust without either leaning over the back of the unit or rotating it, all of which negates the option of fixing the MasterControl somewhere permanent. It would have made more sense to place these dials on the top panel, where there is ample space. Connections aside, the top panel is where the action happens. Once you've installed Alesis's driver, it's a simple matter of selecting your DAW's relevant preset and, within your host software, setting up the MasterControl as a pseudo-Mackie Control before you're away (or HUI if you're a Pro Tools-er). There are presets for Live, Reason, Cubase/Nuendo, Pro Tools, Logic and Digital Performer among others and, as you'd expect, choosing the relevant one means that the control surface switches all produce meaningful results from the off. The lower section of the front panel contains nine long-throw faders, which control eight channels and the master fader of your DAW. The faders feel good, with a decent amount of resistance and very little side-to-side wobble. "There are presets for Live, Reason, Cubase/Nuendo, Pro Tools, Logic and Digital Performer." Above these, each channel features four buttons with Channel Select, Record Arm, Solo and Mute buttons, which speak for themselves. To the right, Bank and Track Up/Down buttons allow you to access the following or previous bank of eight faders, or the next/previous track respectively. At the top of the unit, each channel also features a rubber rotary encoder that can perform one of three functions, as selected by the buttons to their left. The MasterControl is programmed with different functions per DAW preset, and a collection of detachable plastic strips is provided so that you can affix the relevant default controls to the MasterControl for easy reference. So, the all-important question - how does the MasterControl feel as a DAW controller? Well, in the main, it feels pretty good. The faders are excellent, while the generous space afforded to the Channel Select, Record, Solo and Mute buttons means you rarely find yourself inadvertently clicking the wrong button. You also get used very quickly to using the matrix of buttons below the LCD as computer and DAW control switches. These have dual 'A/B' functionality and can be used to drive computer- and DAW-specific functions direct from the MasterControl. So, for instance, you can activate computer functions such as Save and Undo, or instruct your DAW to, say, cycle. In Logic, we were particularly impressed by the fact that the mixer is configurable from these switches to either give a global 'see everything' view or to show only audio tracks, instruments or auxiliaries, for instance. The Preview button plays a nice role here, too; while more plastic tabs are provided to remind you which switch operates what, a simple Preview press followed by one of the buttons tells you how the buttons are assigned on the screen itself. "The faders are excellent, while the generous space afforded to the Channel Select, Record, Solo and Mute buttons means you rarely find yourself inadvertently clicking the wrong button." Moving on, the rotary encoders do their jobs nicely. One word of warning, though - the only configurable switches on the MasterControl are those below the LCD and, even then, each switch can only be assigned to one of a preset list. That said, the whole unit can be switched so that all physical controls output your MIDI control change messages of choice, so it's still possible to use these controls with your favourite hard or soft synths, for example. However, we'd really like the MasterControl to be able to address a wider range of parameters without switching into MIDI CC mode - there's space for at least two more buttons (and therefore two more pages) of control access next to the encoders, and we'd love to see the MasterControl grow in this respect. One extremely neat onboard feature is the MasterControl's Direct Monitoring option, which is accessed via its own button on the left-hand side. A simple press of this lights the switch red and immediately disengages the unit from its DAW control assignments, instead allowing you to set up the incoming audio signals as you wish. This is possible because the MasterControl contains its own low-latency DSP-based cue mix capabilities, meaning you can monitor through the unit directly rather than having to go in and out via your DAW. When you disengage the Direct Monitor button to go back to DAW control, the monitor mix you've just tweaked is automatically saved. The MasterControl features three stereo outputs. This means, if you simply configure as Alesis intend, that you can easily drive your pair of monitors of choice via the A, B or C buttons on the front panel. However, it's also possible to configure the MasterControl to use all outputs at once, so 5.1 surround monitoring options can run from this unit. The front panel also features a Talkback button with a microphone that can be sent to whichever monitors you're using, but be warned that the switch is somewhat counter-intuitive - due to its proximity to the microphone itself, anything you say through the microphone may well be preceded by the sound of your finger pressing the button. Bit clumsy, that. The MasterControl offers a highly impressive feature set, but it's not perfect. A few things, such as the Gain input controls and the Talkback switch, seem badly designed, while other features such as the range of parameters accessible via the front-panel rotary encoders, seem a bit thrifty at times. These gripes aside, this is a fine multi-input audio and MIDI interface that gives you plenty of audio I/O - 28 ins and six outs, to be exact - and has a tactile control surface that's pleasurable to use. It's staggering that so much is available for so little.